Communicating ideas clearly is often one of the greatest challenges in academia; a challenge present in the classroom, at scientific meetings, in publications, and while interacting with the general public. Artistically presented colorful and engaging visuals can convey concepts and add an additional level of understanding that words alone cannot. The majority of my artistic works focus on conveying scientific ideas in an abstract setting to connect to a more general audience or altering publication graphics to more clearly and completely convey a concept visually. 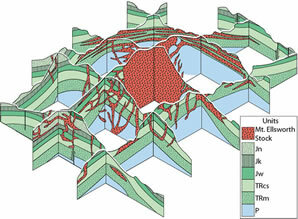 A structural geology textbook by David D. Pollard and Stephen J. Martel that contains over 400 figures which help connect the mathematical concepts behind structural geology to the colorful natural geologic landscapes where these concepts are realized. Many of the figures are redrawn, presenting students with crisp and consistent graphics, but retaining the flavor of the historic publications from which they originated. Ancient Greek figures paired with colorful people-in-action visually represent the connection between mentally-rehearsed "covert" actions and real-life "overt" actions. The rudimentary Greek figures depict activities requiring skill and practice, while adjacent modern-day, full-color people engage directly in equivalent activities. Similarly, Vyas et al. show that the brain can use rehearsed, "covert" representations of actions to affect the performance of "overt," real-life actions. 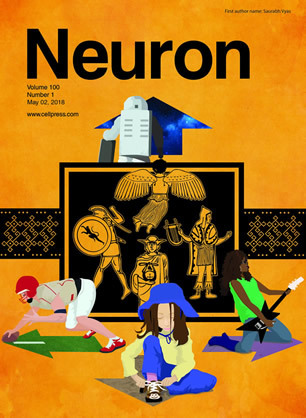 Arrows, originating from the Greek figures, provide a substrate for the real-life activities, a parallel to the research, in which a brain-machine interface is used to indicate that covert and overt movements derive from a common neural substrate. 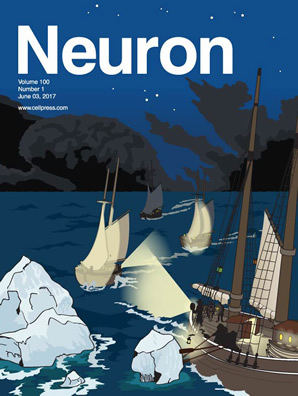 On the cover: A ship signaling other vessels to avoid an iceberg serves as a metaphor for why perturbation-evoked motor cortical activity does not prematurely "leak out" and affect movement. The iceberg and ship lights represent the perturbation and circuit activity, respectively. Course corrections are communicated with lamps precisely aimed from ship to ship. Other lights on each ship do not need to be hidden because these will appear much dimmer than the focused signal lamp and thus will not be mistaken for commands. Similarly, Stavisky et al. (pages 195�208) found that neural responses can vary in a large "space" of patterns without affecting circuit output because these patterns project weakly onto specific movement-causing readout dimensions. This mechanism may be ubiquitous in cortex, represented by a background cloud.